The following post is by Elena C. Muñoz, research/curatorial assistant for the Gateways exhibition. When we met with Rosalia Torres-Weiner in March of 2016, she was one of the artists-in-residence at Latin American Contemporary Art Projects (LaCa) in Charlotte. Wearing colorful and elaborately decorated cowboy boots, she greeted us with a big smile and hugs before sitting us down in her brightly decorated studio-space. Her space at LaCa was decorated with large paper flowers, Calaveras, panels from her children’s story “the Magic Kite” which had just been turned into a play by the Children’s Theatre of Charlotte, and of course, her vibrant, patterned paintings. While sitting and chatting, Torres-Weiner’s passion for social justice and making the invisibles visible, particularly children, is evident. 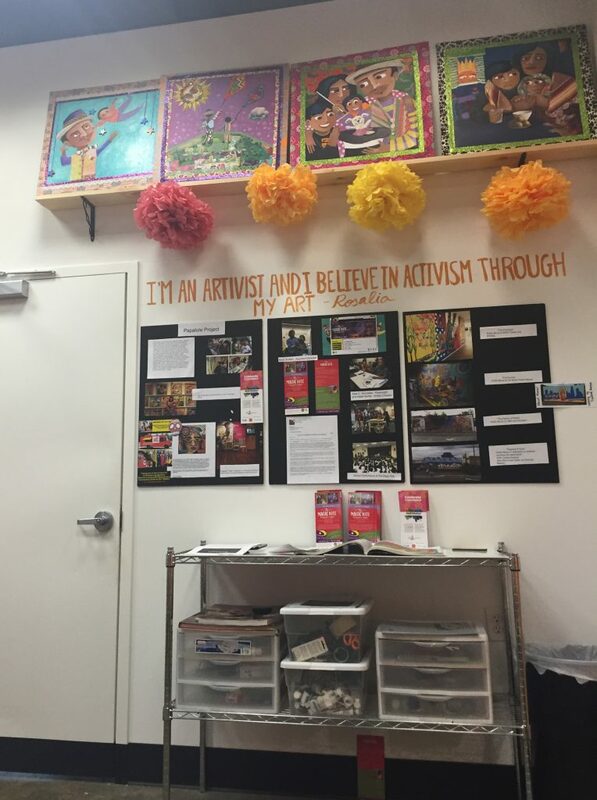 Throughout our visit, her “artivism” and community engagement manifested itself through our conversation, and of course through the paintings that were displayed throughout the studio. Many of Torres-Weiner’s pieces deal with the complexities of the United States immigration system as well as the injustices and dangers immigrants often face. Some of her work sheds subtle light on the plight of immigrants in the United States, but some of her pieces are far more overt. One piece in particular that is direct in its handling of the hazards of immigration and crossing the southern U.S. border is Madre Protectora. This piece is a reimagining of the patroness of Mexico, the Virgin of Guadalupe. The standard representation of the Virgin of Guadalupe is of a young, brown-skinned woman, hands clasped in prayer and eyes cast downward. Typically she is shown standing atop a crescent moon held by a cherub and encircled by a golden mandala.Torres-Weiner’s version of the Virgin has morphed from a static, passive depiction of holy femininity into one of vigilant agency. Instead of being clasped in prayer, her hands clutch a three-dimensional AK-47 constructed of wood, one finger on the trigger. A small, golden pocket watch dangles from her trigger finger, which in Torres-Weiner’s words, “indicates that over time, this situation will change”. Though her dark eyes are still averted from the viewer’s gaze, they are raised and alert, searching for any sign of danger. The crescent moon and cherub are replaced by a blood red banner proclaiming her new moniker of “Madre Protectora”. Her golden mandala is supplanted by pink hibiscus flowers and stylized white dots, which according to the artist are, “one thousand points of loss. Each dot representing a life lost on the border.” The painting is recessed within a blood red wooden frame, with four lines of plastic barbed wire encasing the bottom of the piece, representative of the U.S.-Mexico border. Behind the wire are three red figures: the Virgin Mary, Jesus, and a pope. I have always been obsessed with the devotion to, and various depictions of the Virgin Mary, particularly in Latin America and by Latino artists. The fact that a woman, (and oftentimes a non-white woman) was such a potent instrument of conversion during colonization, and can still command such power, zeal, and national pride is incredible to me. 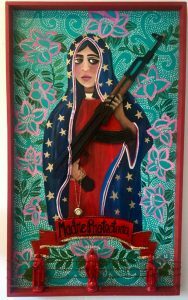 That being said, when we walked in to Torres-Weiner’s studio, I was immediately drawn to this armed Virgin. 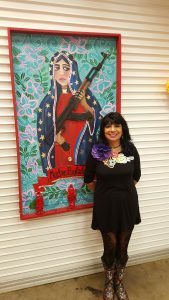 Madre Protectora follows a tradition of Mexican-American and Chican@ artists not only depicting the Virgin of Guadalupe, but of depicting her as one of active, maternal protection, central to the immigration experience. Like many Catholic saints, the Virgin of Guadalupe is regularly prayed to for help and protection. Here, Torres-Weiner has imbued her with a hyper-vigilance that speaks to the extreme anxiety and desperation that often comes with the experience of crossing the border. Torres-Weiner is confronting the life-threatening circumstances that people often face when they come to the United States, whether it’s during the journey, or once they reach their destination. and Latino art. She is also fascinated with the evolution and uses of Marian imagery in the Americas. In 2014, she was a recipient of the Smithsonian’s Latino Museum Studies fellowship, working with the Teodoro Vidal Collection at the Lunder Center and the Smithsonian American Art Museum. Currently she is a research assistant at the Anacostia Community Museum, working on the upcoming exhibition Gateways, which examines Latino im/migration in the D.C. Metro Area, Baltimore, the Raleigh-Durham region of North Carolina, and Charlotte, North Carolina. Rosalia Torres-Weiner is a self-taught artist-activist who has lived and worked in Charlotte since 1992. Born in Mexico City, Mexico, she came to the United States in 1985. After working in the hospitality industry, she gradually turned to a career as an artist. She initially worked as a flight attendant; after painting murals in her children’s rooms, her neighbors commissioned her to paint murals in their homes. She launched her company Home Art Designs in 2001, painting murals in residential as well as commercial properties. 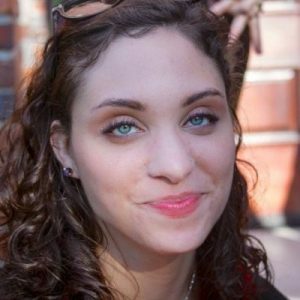 In 2010, she pivoted and began to focus primarily on using her art as activism for the Latino community. She started the Papalote Project, (the Kite Project) using art as therapy for local children who were suffering from the loss of a parent due to deportation. She continues to produce socially conscious and community-engaging work from her studios in Charlotte, NC.